Wild looks . . . bold spot patterns . . . playful . 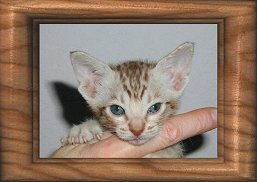 . . yet friendly & social -- these are the characteristics that WildTracks Cattery strives for in every distinctive Ocicat kitten and cat we raise. 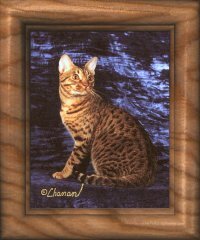 The Ocicat is a unique cat bred for a "back to the wild" look, yet its ancestry of domestic cats provides a gentle, fun-loving pet for every home. WildTracks is dedicated to developing the best of these fine Ocicats, and our cattery continues to win awards from CFA cat shows. From the heart of the Rockies, WildTracks cats come from an award-winning stock of foundation cats. These cats are shown around the country, and occasionally we have kittens or cats available. Available kittens are all in the best of health, have all their shots, and are usually already spayed or neutered. Kittens are kept in our home until they are four months old, to ensure good physical and social health. Kittens socialize by playing with other kittens and with people, and we want all our kittens to be the friendliest and most playful! Purchaser agrees to take good care of this cat so as to provide food, shelter, correct routine and accident related medical attention, exercise and affection. It is recommended that this cat or kitten will be kept indoors and not be allowed to roam freely outside. Said cat is guaranteed to be free from congenital defects and genetic disease for a period of one year from date of sale. Cat is guaranteed to be of acceptable temperament, although buyer is responsible to ensure adequate socialization. It can be returned to the breeder for a replacement of equal quality. It can be kept by the purchaser and a refund of 100% of the purchase price will be credited towards another kitten of the same quality. If, for any reason and at any time, the purchaser is unable to continue to provide a home for the cat, the cat may be returned to the seller with no compensation. If the above conditions are not met, the ownership of the animal shall revert to the breeder herein named without any compensation. WildTracks is registered with the Cat Fanciers Association (CFA) and The International Cat Association (TICA).